With all the venom directed at public employees these days, it’s hard to separate the facts from the attacks. Here’s a guide to common claims made about government spending, taxes, and public employees. The Claim: Government employees are overpaid. The Facts: The Economic Policy Institute measured state and local public workers against their private sector counterparts with the same age, experience, and education. They found that public workers earn about 11 percent less. 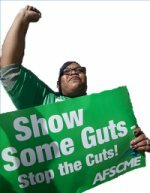 Public workers had better benefits on average, but even when health care and retirement were included, public workers were still 4 percent behind private sector counterparts. Claims that state and local government workers are overpaid often fail to account for their education and experience. Fifty-four percent have at least a four-year college degree, compared to 35 percent in the private sector. The Claim: The federal deficit is out of control. The Facts: It’s true that this year’s budget deficit—projected to be 10.3 percent of U.S. economic activity—is the highest since World War II. Whether it’s a problem depends on your time frame and how we address it. Short-term government spending was the only thing that kept the economy from cratering in 2008. It staved off a second Great Depression. With no private sector investment in sight, public spending will be the only engine for job creation in the foreseeable future. Aside from the pain created by high unemployment, no jobs means no recovery for tax collections and therefore a widening deficit. The deficit is a long-term problem if we do nothing, but before doing something we have to look at spending and revenues. The bulk of federal spending is on the military (22 percent) and health care, including Medicare, Medicaid, and children’s health programs (21 percent). The obvious place to start trimming is today’s military budget, which is two and a half times what it was 10 years ago. Health care costs are also skyrocketing, because they are driven by for-profit health care. A single-payer system like “Medicare for all” would correct that. The Claim: Taxes are too high. The Facts: Depends whose taxes you mean. According to Citizens for Tax Justice, overall taxes in the U.S. are the third lowest among industrialized countries (only Turkey and Mexico are lower). Corporate taxes are also lower than in most other industrial nations. But there are inequities—and they favor the rich. People at the bottom of the income ladder, the lowest 20 percent, pay almost twice as much of their income in state and local taxes as the top 1 percent. The poor pay 11 percent, the rich just 6 percent. At the end of World War II corporations paid more than a third of all taxes collected by the federal government. Today they pay only 10 percent. The burden was shifted to individuals, and as taxes on the wealthy were cut over the last 30 years, the liability has been transferred to working people. The Claim: The private sector is more efficient than government. The Facts: Advocates claim outsourcing will save money. But after more than two decades of experience, reality isn’t so clear-cut. Cost overruns combined with the cost of contract monitoring and administration often makes privatization more expensive than in-house services. According to a 2007 survey by the International City/County Management Association, more than one in five local governments had brought previously outsourced services back in house. In most cases insufficient cost savings were cited as a primary reason. And where contracting out does produce savings, they typically come from lower wages and benefits for workers—not some supposed inherent superiority of business. The Claim: Government waste, fraud and abuse are rampant. The Facts: Government-bashers love to talk about overpaid, do-nothing bureaucrats, but if you’re looking for misused tax dollars your best bet is to scour the Chamber of Commerce’s membership list. Defense contracts and construction projects like the “Big Dig” in Boston hold taxpayers hostage with wildly inaccurate, often fraudulent cost estimates. According to the Project on Government Oversight’s database of federal contractor misconduct, the top five defense contractors have racked up 156 instances of misconduct since 1995, totaling $3.57 billion in fraud and waste.